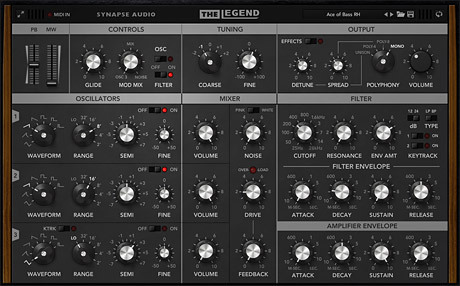 Developed in cooperation with vintage synth specialist Bigtone Studios, The Legend is designed to faithfully emulate one of the most famous vintage analog synths. Moreover, numerous innovative enhancements greatly increase its versatility. Every component, ranging from the voltage-controlled oscillators (VCOs), voltage-controlled filter (VCF) and voltage-controlled amplifier (VCA), have been modeled to an accuracy never seen before in software. The snappy filter and amplifier envelopes have been meticulously modeled, as well as the massive bottom end - even the most marginal effects like temperature drift or effects originating from the power supply have been taken into account. The most significant additions are the Unison and Polyphonic modes, allowing for thick stereo sounds, as well as enabling polyphonic play. Built around a vectorized core, The Legend is capable of synthesizing four voices for the cost of little more than a single voice, making it a highly efficient analog-modeling synthesizer plug-in. 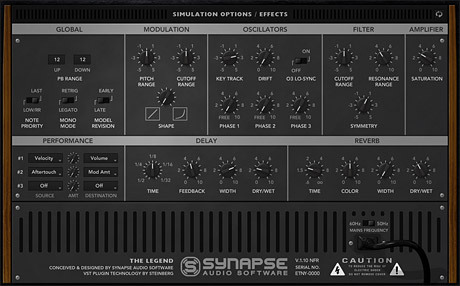 The back panel of The Legend allows to switch between two revisions modeled, Early and Late. Moreover, extra options allow to fine-tune the analog simulation and account for part tolerances typically found in hardware. The key parameter ranges can be adjusted as well as tuning, drift or saturation. Another bonus feature of The Legend is its on-board effects, comprising a high-quality delay and reverb unit. Both effects are tailored to the synthesizer, and offer just the right sound with only a few parameters each. 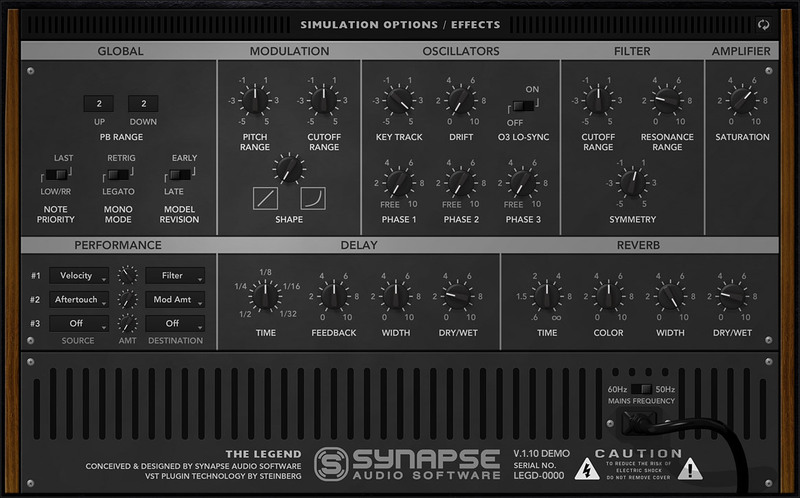 The Legend comes with 480 patches crafted by leading sound designers and sorted into categories like Bass, Lead, SFX, etc. The Legend supports Native Instruments' NKS format. It is compatible with Maschine and Komplete Kontrol S-Series keyboards. 2 GHz quad core CPU or better, at least 4gb of memory, VST2 or AU compatible host software, Windows XP or higher, OS X 10.7 or newer. Both 32- and 64-bit versions are provided.